Most of my free time these days has been spent working through my classes. Since that time is so limited, that's meant that my sewing machines have been on vacation while I work toward my certification. Last weekend, I decided to take a break from my coursework and sew this simple, sweet, free(!) pattern by Oliver + S - The Popover Sundress. It was invigorating to get back to creating - taking what was a pile of fabric and turning it into something. Oh, how I've missed it! 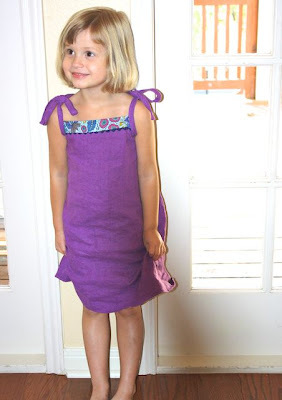 I do have a few suggestions to help make sewing this sundress even easier. 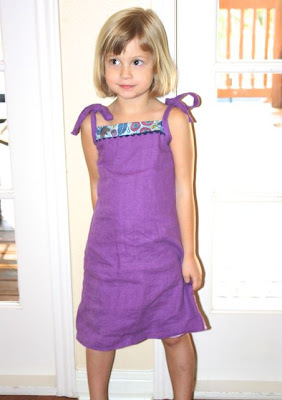 * If you have serger, serge the sides of the dress before sewing it together. Then all of your seams are finished and the dress comes together in a snap. * After you sew the strap to the wrong side of the dress (Step 3), trim the seam allowance to 1/4". It's easier to wrap the strap over the seam allowance and cover the seam line (Step 6) this way. *Indi's on the taller side, so I cut the dress one size up for the length only. This was perfect. I used this european linen which I found on sale for 80% off. I was very happy with it... and so was Indigo. For the yoke, I used a bit of Anna Maria's voile that I had on my shelf. I had planned to add pockets like this, inspired by this dress, but Indigo didn't want pockets this time. Sometimes pockets can be a little fussy so this was a-ok with me. I think every little girl in Texas deserves one of these dresses. your therm. looks like ours!! crazy huh? you guys stay cool. very sweet!! I have been sewing like crazy too, but draperies, so not s cute and fun as little girl dresses!! Isn't this drought HORRID!?! 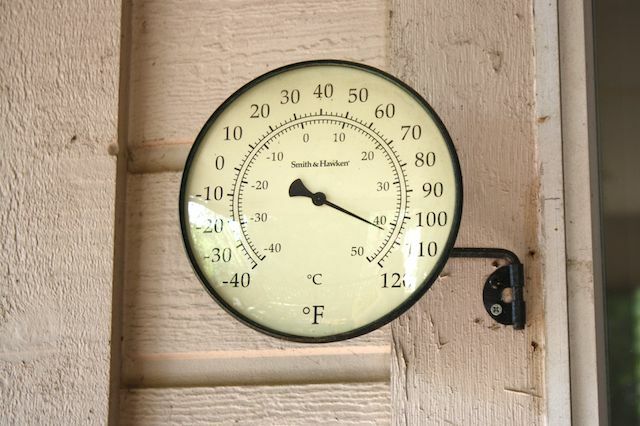 Enjoy the A/C!